“It’s rock pop with a classical twist.” Musically, it’s nothing out of the ordinary, but the classically trained opera singer fronting the band certainly knows how to put on an entertaining show. We’re talking about Los Angeles rock-pop artist Electra Barakos and her band, Electra. This fearsome foursome hit the House of Blues on November 21 with a distinctive blend of rock, pop and a touch of opera. It’s unique, not only because it incorporates operatic themes, but also because Barakos keeps it in the family. Barakos’ dad (Yanni Barakos) has been her bass player since the band formed in 2009. Raised in her father’s musical environment—her dad has a progressive rock and jazz background—has helped her expand her musical repertoire. They don’t always agree on music but, said Barakos, “For the most part, we like the same stuff — so yeah, I think we’re on the same page most of the time.” Her brother Andy Baracuda, is also involved in music—as a DJ—and he joined his sibling on stage to showcase a brand new song called “Longer” — which was pretty legit. Born in Los Angeles but raised in Greece —it was her love of music that brought Barakos back to America. “Greece is incredible, you can do whatever the heck you want, but I do love LA — I’m here for a reason. This city gives you a lot of opportunities.” Opportunities? Yes; and one opportunity came through by way of her dedicated fans, who helped her band raise $22,404 via Kickstarter to record their new album “These Times” — scheduled to release in 2015. “Honestly, I owe everything to them [her fans] with this album coming out, if it wasn’t for them, it wouldn’t be what it is. If it wasn’t for them, I wouldn’t be on this stage — I’m incredibly blessed by lots of loyal people,” explained Barakos. Fortune, fame and fans don’t happen overnight, people. It takes time, patience and persistence, especially in this crazy city. 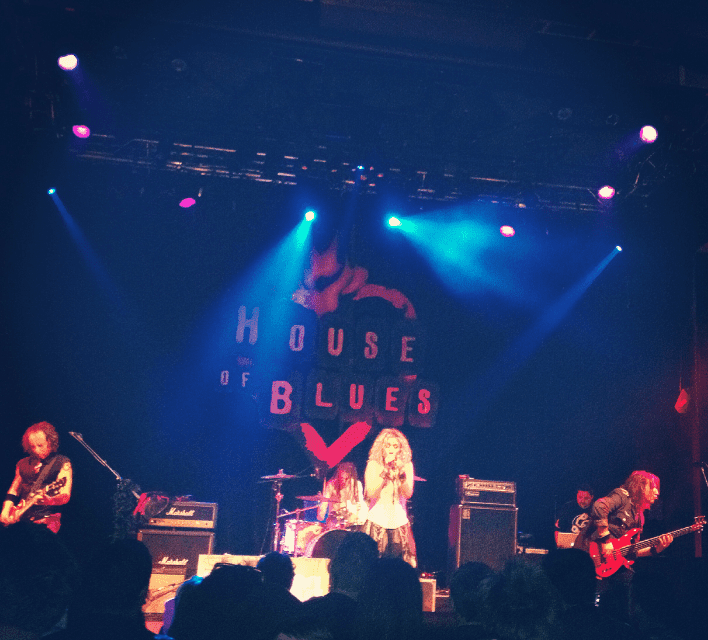 Electra has been hitting the Los Angeles and Orange County music scene since early 2009. They’re not exactly hard rock—the vocals are clean toned, with a wee bit of opera and a few killer pop-rock melodies. “What I’ve done with the new album is I’ve incorporated a lot of operatic vocals in there so it’s like rock pop with a classical twist,” said Barakos. After hearing them live, it wouldn’t hurt if the band highlighted a bit more of the rock opera during their performances. Barakos herself can definitely belt it vocally, but the opera theme was a bit unexpected and didn’t seem to gel with the HOB crowd. However one thing that did gel were the cover songs. Insert the Bee Gees “You Should Be Dancing” right here. Guitarist Hyland Church ripped his Gibson as Barakos dished out mini tambourines to the crowd during the Bee Gee’s classic. Kudos to the band for picking cover songs that kept the crowd intrigued. Electra closed the show with a wicked rendition of Led Zeppelin’s “Whole Lotta Love.” Drummer Dan Welby kicked the Bonham beats while Church ripped the signature guitar riff. It was a great way to end the night, especially since it was the House of Blues and the songs were in Electra’s vocal range. Frankly, Electra isn’t trying to be someone else. Yes, they’re a pop-rock band but they do it in a cool way. What’s most important is the band looks like they are having fun, and isn’t that what it’s all about? Music, guitar, bass, drums and family members on stage—that’s pretty awesome. Once Electra’s new album is released, the band hopes to get out and tour the United States.